Second in BillyBadAxe’s Classic Electric Guitars 101 series: The Gibson Les Paul is the quintessential heavy rock guitar. We’ve also covered the Fender Telecaster, and the Fender Stratocaster. Check it out! The guitar that helped usher in the rock era. The guitar was first introduced in response to the success of the first Fender solid-body guitar, the Esquire, which was later to evolve into the better known Telecaster. Such was the demand for solid guitars that Gibson, which had hitherto rejected solid models, felt it necessary to compete. Guitarist Les Paul had come to the company in the late forties with a model for a solid guitar, which he had named “the Log,” an appropriate enough moniker considering the “guitar’s” humble origin as a fencepost. Gibson now turned to Paul with a request to allow them to add his name to their new guitar. Debate remains over the scale of the contribution that Les Paul made to the original model; certainly, it differed significantly from his prototype, being a semi-solid rather than the fully solid body guitar that he had envisaged. Nevertheless, when the guitar was released, it carried Paul’s name on its headstock, and he was to play his own personalized model for the rest of his life. 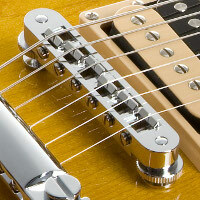 The guitar was originally released with a trapeze style bridge and P90 single coil pick-ups. By the end of the decade, however, the Les Paul was modified with a new “Tune-o-Matic” bridge, as well as humbucker pick-ups for a fuller sound. The Gibson bridge is notable in its difference to the Fender models, which required the strings to be threaded through the body of the guitar, while Gibson preferred to keep their strings on the front of the guitar’s body itself. At the same time, the Les Paul’s heavier weight combined with the humbuckers gave the guitar a fuller sound that, frankly, the late 1950′s-early 1960′s guitarists didn’t know what to do with. The result was that the Gibson guitar fell out of fashion for a period. As a result of the fall in sales, the company radically changed the design of the guitar to more closely match that of the Fender Stratocaster. The body was changed to a fully solid design, while the single cutaway of the original model was augmented by a second above the neck. This model was marketed as the “New” Gibson Les Paul guitar in 1961. The legend goes that the first time Les Paul himself became aware of the changes was when he passed a guitar shop window and spotted the new guitar with his name on it. Accounts vary regarding the nature of Paul’s reaction to these changes, with some claiming that he was furious that the company had gone over his head and changed “his” guitar, while others state that he was quite happy with the sound of the new model, but was inclined to keep his name off the guitar until an issue with the neck was resolved. Still more claim that he asked for his name to be taken off the guitar as he was going through a divorce at the time, and the income generated from the guitar would only complicate matters further for him. 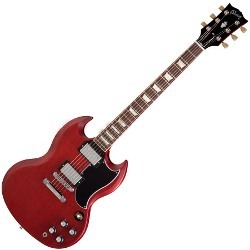 Whatever the reason, the original model was discontinued and replaced by the new Les Paul until the name was dropped in 1963, from whence the guitar was simply marketed as the “Gibson S.G.” meaning solid guitar. Most guitar historians ascribe the resurgence in popularity of the original Gibson Les Paul design to the playing of Eric Clapton with John Mayall and the Bluesbreakers on their self-titled album of 1966, most often referred to nowadays as the “Beano album,” due to Clapton’s reading matter on the cover. This was the album that gave rise to the walls of London being daubed with the phrase “Clapton Is God,” an indicator if one was needed of the level of influence Clapton had on the British music scene prior to the arrival of Jimi Hendrix later that year. Clapton had been influenced by the guitar playing of Hubert Sumlin, probably best known today as Howlin’ Wolf’s guitar alter ego on tracks like Smokestack Lightning and Killing Floor, as well as the super cool Spoonful. In later years, the Les Paul would come to be mainly associated with the work of Guns ‘N’ Roses guitarist Slash, who led the charge with the guitar in the closing years of the eighties and into the nineties. Like the Fender Corporation’s fortunes under CBS from the late sixties to the mid-eighties, the Gibson Corporation also underwent what is seen as a period of mismanagement during the same period when it was purchased by the Norlin Company. Bought by Henry Juszkiewicz and David H. Berryman, the respective current C.E.O. and company president, in 1986, the company’s fortunes were again on the up. Its guitar production area was moved around the same time from the old factory in Kalamazoo to the present location in Memphis, where high quality, top end Gibson Les Pauls are still made to traditional exacting standards. A little LP love on the cheap. Epiphone’s Les Paul Special II at $150. Gibson’s budget subsidiary Epiphone also produces good quality instruments at even more affordable prices, due to their foreign factory bases in locations like South Korea. Epiphone Les Paul models are not given the same quality of attention during manufacture as their Gibson counterparts, nor are the parts used of an equivalent standard, but the company’s models are nevertheless worth exploring as they will provide great tone and years if not decades of service for a fraction of the price.